Holt, left, receives award in Germany. 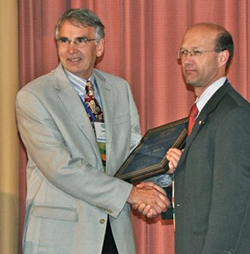 PULLMAN, Wash. – James R. Holt, professor of engineering and technology management at Washington State University, received the lifetime achievement award at the 2013 TOCICO International Conference in Bad Nauheim, Germany. James Holt accepts lifetime achievement award at national symposium in Utah. 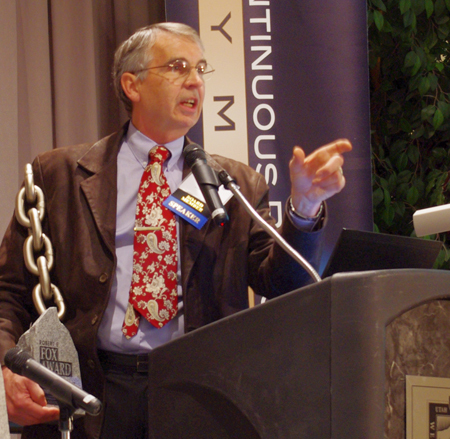 PULLMAN, Wash. – James R. Holt, professor of engineering and technology management at Washington State University, received the Robert E. Fox “The Race to Excel” Lifetime Achievement Award at the Fifth Annual Continuous Process Improvement Symposium at Weber State University in Ogden, Utah. The award is given for continual dedication and contribution to improving processes involving industries, organization, services and individuals.